I wanted to share my students cards and gifts they made over the last couple of days for Fathers Day. You can read my post on this packet here and it is available for purchase here. So without further ado, here are their cards. I love how these boys decided that their Dad's would like to have their favourite football team colours on the card. To be honest this was not even something I had thought of but next year I will be better prepared as some of the kiddos asked me what are the colours for ....team. I had no idea. Next year I will have the football team colours ready to go on the whiteboard. Here are the coasters the kiddos made, I think they came out really cute! I hot glued a piece of felt on to the back. Here it is in action with my coffee cup. I would love to see what some other Aussie teachers have created for Fathers Day! Oh and Happy Fathers Day for Sunday all you Aussie Dads. 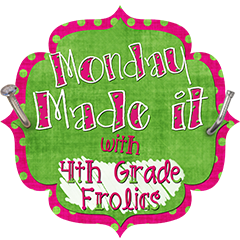 I am linking up with Tara at 4th Grade Frolics for this weeks Monday Made It! I have decided to revamp my rules posters for this weeks Monday Made It. It is something that has been on my to do list for a while now. Here is how I updated them. I used graphics from Mel at From the Pond, the apple graphic is one I created and the font is a standard one on Microsoft, Segoe and one from Kevin and Amanda Carrington (?) On my old rules I just had the "negotiated" rules that I would discuss at the beginning of the year with the students. After being part of a PBS school I decided to add the headings RESPECT, RESPONSIBLE, SAFE to each rule depending on what category they came under. I think is important for students to see the reason why we have rules in the class and this is a reminder when we refer to them throughout the year. Once I printed them off I glued them onto coloured paper and laminated them. I used red gingham ribbon to join them using a hot glue gun. Now it 's your turn to link up! 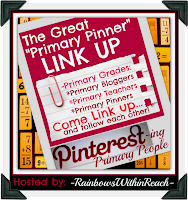 I'm linking up for the Primary Pinner Pinterest linky hosted by Rainbows within Reach. I only discovered Pinterest a few months ago and I love it! In fact Pinterest is what led me to blogs which led me to blog stalking which led me to blog creating. So link up an add your Pinterest! Right there is MY Fathers Day gift and card set featured!!! Woohoo!!! Just wanted to share a couple of items I have made while I have been home with sick kids over the last couple of days. In between all the nose blowing, medicine taking, soothing and going to the doctors I managed to fit in a bit of blogging, a bit of creating and a bit of updating. The first one I wanted to share with you is an update of a game I had made many years ago before I had any computer knowledge, I have revamped it and turned it into a digital file. It is called CVC Rhyming Snap, kiddos get to Snap! if they have two cards that rhyme. I still use this with my grade 3's purely because they like playing any kind of card game and it encourages visual discrimination. I like to make my cards so that they have to be folded over before you laminate them, this way it stops that "see throughness" you can get sometimes when you print them on white paper and it is cheaper than printing onto card. The second item I made is called Go Fish Alphabet. It is great for Kinder and consolidation in Year 1, and is easily played independently if students know how to play Go Fish. 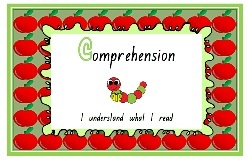 The students have to match letters with the card that has the corresponding picture and word. If they can't match it- well Go Fish and pick up. Once again I have made these cards so that they have a front and a back. If you like the look of these items you can check them out here at my store or by clicking on the picture. Hey, hey, hey. Megan at "I teach. What's your Superpower?" is having a 400 follower Giveaway and it is a good one! Go and check it out! Now!! 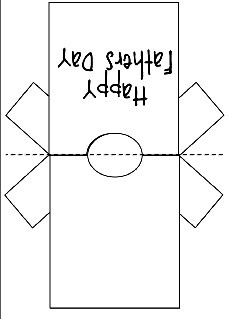 I am linking up again with Tara at 4th Grade Frolics for Monday Made It. Tuesday but didn't link up in time. 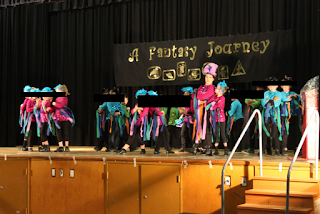 You may have seen my earlier post on my students performance last week, you can read about it here. Well most of the costume that my kiddos wore were provided but they didn't have any wings....and a parrot needs wings. So I set about making 23 sets of wings...yes 46 wings altogether. It took me a couple of goes to get it right but in the end we flapped up a storm for our dance and they looked great! Here are some pics of how I made them. The first time round that I made them I was trying to be quick and easy, so I started off by cutting lengths of black material and sewing on loops of elastic at either end of the material. I then cut lengths of crepe paper in descending lengths to mimic the wings of a bird. But I wasn't happy with how they puckered and the streamers got ripped off quite easily. So that's what happens when you try to take the easy way out. I then had to pull out all the staples out of 23 sets of wings and re do them. This time I glued the streamers on with fabric glue and then ran a bead of glue along the top section. Folded the fabric over to cover the ends of the streamers and let it dry. This resulted in a stronger hold on the streamers and we only lost a couple before the dance! As you can imagine after having to do all those wings (twice), rehearse, organise the rest of the costumes and perform, there was no way I was going to make the previous Monday Made It, but I am so glad I finally got to this one. 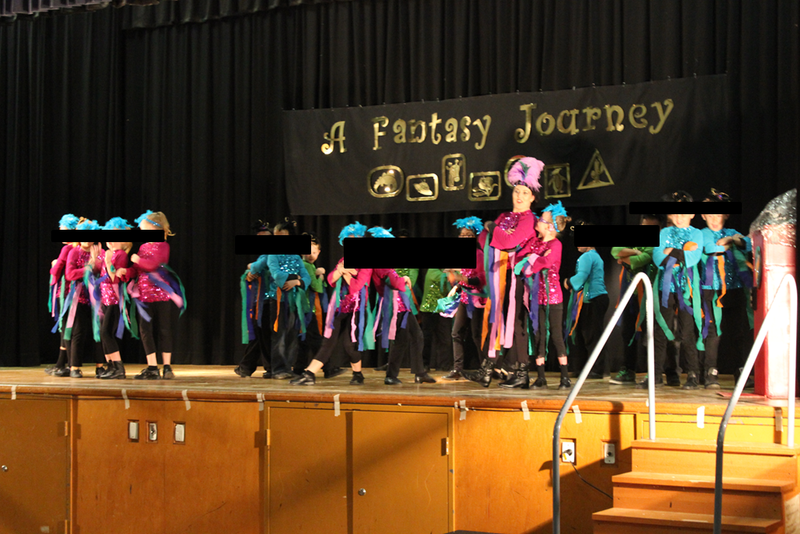 Here is a pic of my students and me performing. Fathers Day is just around the corner for those of us that live in Australia. (Alright I may be just a little early) This year I plan on being organised and ready for it, I usually end up saying to my Teacher Aide "Is Fathers Day this weekend?" then we rush around for that week getting a card and gift ready. Not this year! I am ready and Fathers Day is about 3 weeks away. I usually make the same gift each year, only because I think it is a really cute and useful gift but this year I have tidied it up a bit. I make a cute t-shirt card and a coaster for Dad's to put their "beverage" on and Mum will not get cranky at him for leaving rings on the table. I have also included some non Dad specific (?) 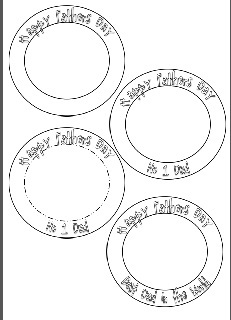 coasters and a blank card for those littles that may not have a Dad to give a gift to. I always encourage these kids to make a card and gift for either a special male in their life (Grandad or Uncle) or for someone who helps them alot and that shows them lots of love. Here are a couple of pics and you can find it here at my TpT store. Wow!!! Last night we had our Dance Spectacular at school. This is a concert that showcases the dances our students have learned in the previous term. We are very lucky in that we have a visiting professional dancer teach and choreograph our dances for a 10 week block, then over the next few weeks we practice the dance with our class. We make or hire the costumes and are often working right up to the last minute to get it right, then in Spectacular fashion we perform our dances for the families. This year my class were parrots and performed a dance to the song "Take me to Rio" from the movie Rio, we looked fabulous with lots of bling and feathers! As some of you may know I have a special needs student in my class, "Mary" and she requires quite a bit of support to get through the day, this includes performing the dance. I was very lucky to be able to dance with "Mary" and help support her through the dance. She was AMAZING and so excited to perform, and just like me she does love a dress up so we had lots of mutual admiration for each others costumes. Here are is a pic of my class enjoying their performance and a special pic of me and my special dancing friend. A HUGE congratulations to my whole class who performed beautifully and who also supported "Mary" throughout the whole process. I will be including how I made the wings for our costume in the next Monday Made It Linky, I was just too busy making and rehearsing to get up a blog about them earlier! This year I have started using an apple theme in my classroom and am trying to incorporate it in most aspects of the year. So I had to create new CAFE headers, you can find them at my TpT store for FREE! 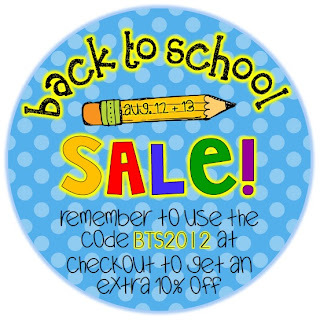 Just like many others I am joining up for the TpT Back to School Sale and I am linking up with Amanda at First Grade Garden for her Back to School Sale linky. I wanted to give a shout out to one of my fave friends and her blog. Now it isn't an education/teaching blog but it is a craft blog. I know that lots of you out there are way more into craft than I am and she always shares pics and explanations of her current craft item. She also shares thought about books, being a new Mum and cooking. 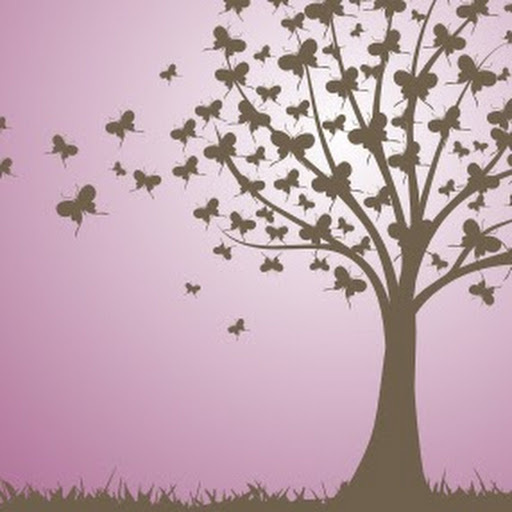 If any of this interests you please head on over and visit Abbey at Little Purple Forest. I hope to catch up on more posts and happenings from our classroom but I have had a really full on week with an excursion yesterday and dance practice for our performance next week. Why does it feel like it never ends? Best Wishes to those in the north heading back to school! A birthday, a performance and 50 followers! Wow! Leave the blog world for a week or so and so much happens! First I would like to share a couple of pics with you. I have had a HUGE week both at home and at school. 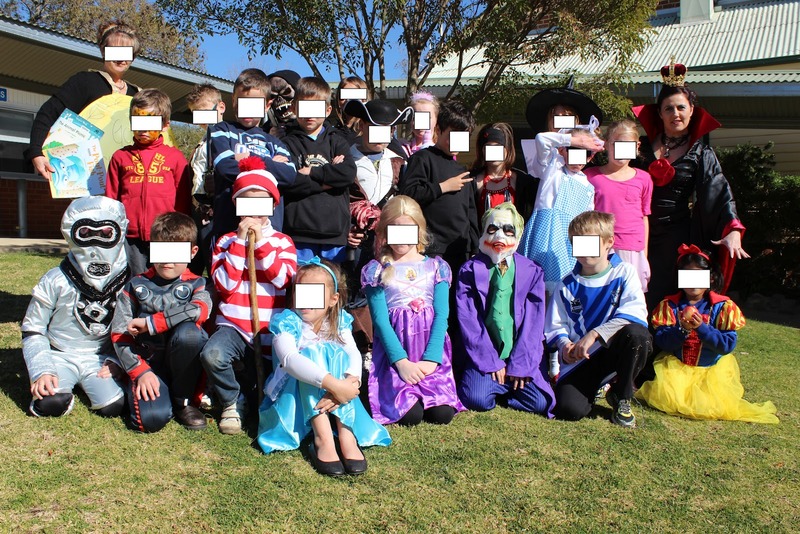 After spending some much needed family time together I was back into school with our Book Week Parade. 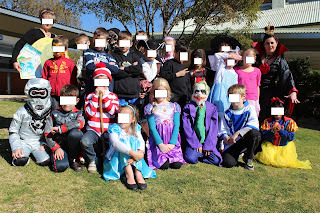 I also had my 40th birthday on the same day so essentially I had a huge whole school fancy dress party. Here is my class all dressed up! Unlucky for Snow White to be in my class! We all had a fun day and I even made apple cupcakes for the staff (I thought it was funny!) and made chocolate cupcakes for my class. 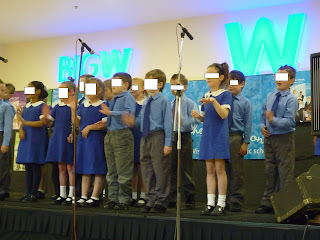 The other big event that we had the very next day was performing for Education Week. 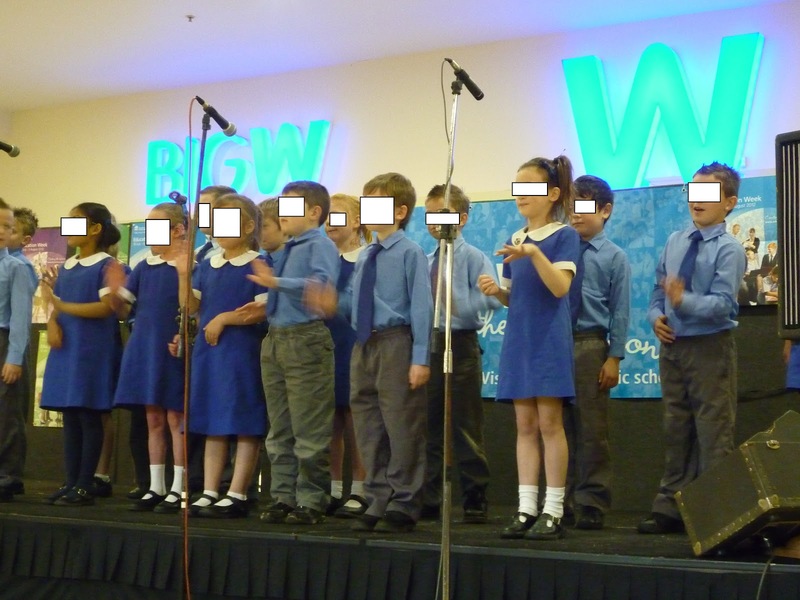 We joined other public schools at the local shopping centre to perform 2 songs using sign language. We sang "The Rainbow Song" and " The Wheels on the Bus." Many of the students and myself have only started learning sign language this year as we have a little girl in our class who is profoundly deaf amongst other challenges, see my post about her here. I was SOOOOO proud of them! We had a huge crowd and we sang unaccompanied by music so it was really up to them to make sure they sang loud and proud. To top it off there were a few members of the deaf community in the audience so I was really nervous that they wouldn't do the right signs. In fact I was so nervous that when my principal asked me to introduce them I felt so nauseous I couldn't speak and she had to introduce them. Don't get me wrong I wouldn't have been half as nervous if it was just me up there, but these kids were 7 and 8 yrs old and like I said it was a huge crowd! To top everything off I reached 50 followers while I was away, so I am having a 20% off sale at my TpT store, for the next 4 days! So get in and get a bargain, I always price my items fairly low so you might even get a super bargain! Well getting ready for another big week at school, and a big thank you to all those who left comments of support.